In a small dry skillet, toast the cumin and coriander seeds over moderate heat, stirring, until fragrant, about 2 minutes. Let cool, then grind to a powder in a mortar or spice grinder. In a blender or food processor, combine the mayonnaise, shallots, jalapeños, canned chiles, garlic, cilantro, maple syrup, Worcestershire, mustard, vinegar, and ground spices; process until smooth. Season with salt and the lime juice. 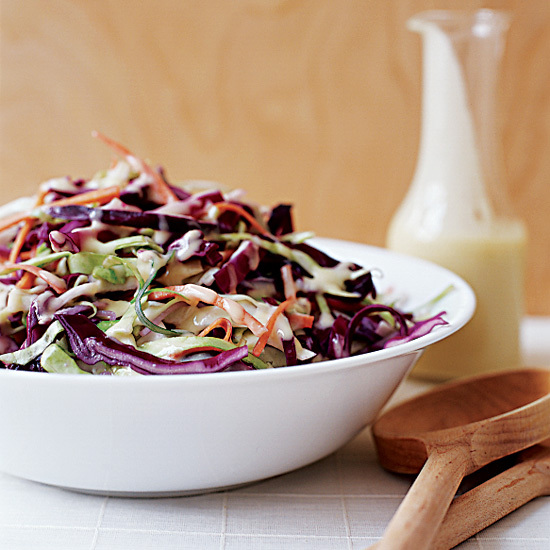 In a large bowl, mix the green and red cabbage with the bell peppers and carrots. Add the dressing and toss well to coat. Refrigerate until slightly chilled or for up to 3 hours. Season with salt before serving. The dressing can be refrigerated for up to 1 day.